A great outreach tool for working with the general public. Helps people understand their options for protecting their property (and, ultimately, themselves). 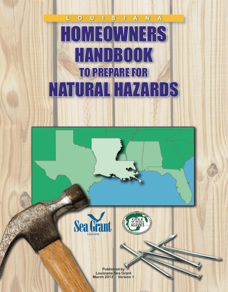 This handbook was created to help you prepare for natural hazards so that risks to family and property may be reduced. While it is never possible to eliminate all potential damage from a natural hazard, as a homeowner you can take action and implement many small and cost-effective steps that could significantly lower your vulnerability. Mother Nature can be intense. Your family and home deserve protection that only you can provide. Available as a free download, the Homeowners Handbook to Prepare for Natural Hazards will be updated as new information becomes available. Additional resources can be obtained from your state and parish emergency management agencies, as well as handbook sponsors and participants. Relevant phone numbers and websites are included in Appendices A and B.